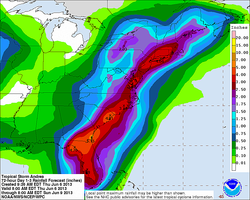 Tropical Storm Andrea strengthened to a 60 mph storm early Thursday as she set sights on Florida and the US East Coast. As of the 11 AM Hurricane Advisory from the National Hurricane Center, Andrea was located about 110 miles west of Tampa, Florida and was moving toward the northeast at about 15 miles per hour. This general motion is expected bring Andrea ashore in the big bend region of Florida later this afternoon. No significant change in strength is expected before this storm makes landfall. 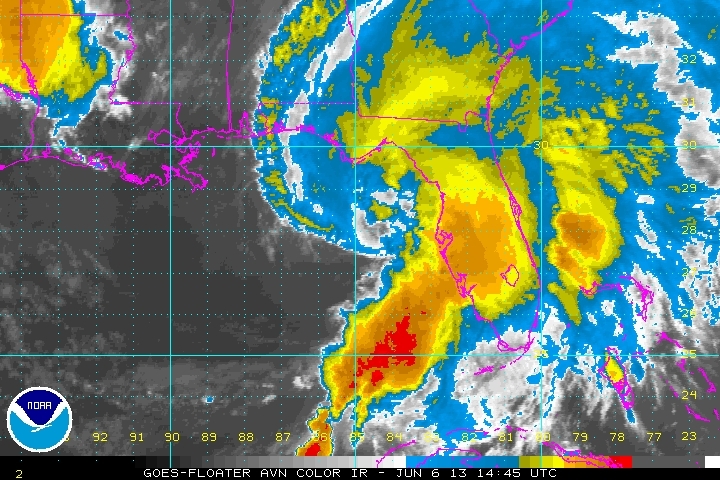 Andrea is a large and wet storm with tropical storm force winds extending out to 140 miles from the center. A broad swath up the East Coast of the United States is expected to receive heavy rainfall between now and Saturday as the storm is expected to follow the coast north and eastward. Areas of Florida are expected to see between 4 and 7 inches of rainfall with some localities experiencing in excess of 10 inches before the storm is over. A wider region of 2-5 inch rainfall is expected to blanket an area from Florida to Maine and will impact most East Coast metropolitan areas. A storm surge of between 2 and 5 feet is expected to impact a stretch of coastline from Tampa Bay to Apalachicola. Areas hardest hit will be to the south of where the center makes landfall, as it brings an onshore wind flow behind it. Intensity of storm surge flooding will depend on tides and timing of landfall over the regions affected. In general, coastal flooding from the storm is expected to be moderate. Andrea formed Wednesday over the Gulf of Mexico just five days after the start of the 2013 Atlantic Hurricane Season on June 1rst. Forecasters expect a busy year with between 16 and 20 named storms forming in the Atlantic Basin. As many as three strong hurricanes could impact the United States, according to forecasters. The 2012 Hurricane Season produced 19 named storms including the devastating hurricane hybrid storm Sandy. Ongoing low levels of sea ice volume, area and extent in the Northern Hemisphere have contributed to an erosion of the polar jet stream making it more likely that tropical and Arctic air masses will collide. This new state of northern hemisphere weather, brought on by human-caused climate change, is likely to increase the frequency of hybrid storm formation as tropical air and polar air is drawn into closer proximity. In the past, powerful hybrid storms were rare events, occurring off the East Coast about 1-2 times per decade on average. Sandy was the first powerful hybrid Hurricane in the satellite record to directly impact the US East Coast. It was also the largest Hurricane, in total area measured, ever to impact this region of the Atlantic. Though it is very unlikely another storm like Sandy will form this year, the risks for this kind of storm are now higher than in the past. The quick arrival of the more normal tropical storm Andrea does, however, serve as a herald to what is expected to be a busy hurricane season.